South Cotabateños let's run and have fun this October 31 - join the Halloween Fun Run 2013 to be held in the City of Koronadal. 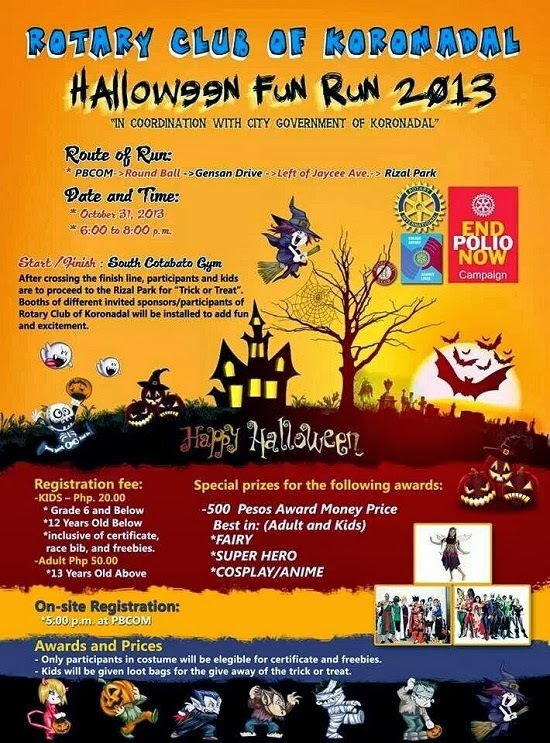 Organize by the Rotary Club of Koronadal in coordination with the City Government of Koronadal, the Halloween Fun Run 2013 is a fun run for a cause to support the End Polio Now Campaign of Rotary International. The same event was conducted last year which gathered hundreds of participants mostly kids dressed in halloween costumes (see pictures here). Surely it will be another exciting halloween costume race, so save the date, register now and see you there! Check out the event poster below for more details.